One reaches that stage in life when you reminisce and recall an incident or two that occurred during the 60’s; in this case with my favourite Austin Seven, ‘CG’; a 1934 RP Saloon, registration mark CG 7241. There’s not much technical content in these tales, but here goes. I read recently that during a snowy period an Austin Seven had been the only car to climb a hill due to its narrow tyres cutting through the snow to terrá firmá. This reminded me of a time when I was trying to make some progress with a stevedore’s daughter. I had taken Cheryl out for a meal at a pub in the New Forest (part of my social area at the time). We left the pub in plenty of time to get to her home before 10.30pm – the hour her father had declared she had to be home, or else! She was over 18 as well, how times have changed. Nearing Southampton, having avoided the black ponies (it seems only the black ones wander across the road at night and 6 volt headlights don’t help), I decided there was time for some close encounters on the rear seat and pulled well over onto the verge. I little time later, with just enough time to get Cheryl home by 10.30, I started the car up, cleared the windows, put the car in gear and we did not move! I opened the door to see that the wheels had worked their way into the verge to the extent that the floor pan was squashing the grass down, which was much further than I had managed to get! Panic, I had to carry Cheryl to the road edge (she had borrowed her mother’s shoes) and thumb a lift to get her home. Well a lorry and a Taxi did get her home by 10.45pm, a few minutes late. However 10.30 was the curfew hour and I was read the Riot Act and I didn’t see Cheryl again. The car meanwhile, well I returned early next morning and a local farmer hitched ‘CG’ up and dragged her out. Nothing was missing, all the tools etc. where still there. Those were the days when you could leave a car out without it being stripped in 2 hours. I was also late for work in Winchester, so heard another version of the Riot Act. I can believe the snowy Austin Seven did manage to climb the hill where all others failed. In the early 60’s I went everywhere in ‘CG’ whatever the weather and although I was used to rain, I was not fully prepared for the following. We were invited to a nurse’s party at Beach Road in Southsea as they had finished their training and were leaving for Sheffield. A couple of Austin Sevens set forth with ten people from Southampton. The party was great, plenty to drink, good music and the company exceptional! At about 3am some of us decided to go skinny dipping, so down the shingle beach, disrobe, and in. Unfortunately it was too dark to see anything worthwhile, so I came out to find my clothes, get warm and put my spec’s on! I couldn’t find them (I never did); they had merged into the shingle. The others came, dried down and got dressed, but without my spec’s my imagination had to fill in the blanks. Now 4.00am, and time to return to Southampton in ‘CG’ then on to Winchester. It was raining heavy, real heavy, the vacuum wiper was having an off night and I couldn’t see a thing anyway without my specs. Eight of us piled in the two cars and we set off, me following the other Austin Seven, at least our braking capabilities were on a par, so not much of a problem of me running into the back of him, if he braked? All I could see was the tail-light (yes one) to follow, but with big blobs of water on my smeared windscreen, which became searchlights and iridescent waterfalls when vehicles passed the other way keeping the light in sight was difficult!. The situation became worse when a ‘modern’ came behind with its brilliant 12volt full beam lights; I was steering into a black hole - “Stargazy pie-eyed”. At one point somebody got between us, I don’t know how considering how close I was following, but I seem to remember it caused some problems, however they soon disappeared, I then sat very closely on the tail of the other car for the rest of the journey. I‘m told I still drive too close to the car in front. We eventually got to Southampton at 5am; I dropped off my passengers and I made my way up to Winchester. I reckoned ‘CG’ knew the road back home better than I did. Her steering was probably less erratic than mine. A police car followed me the last half-mile into a car park by home, and then left us alone. I often wondered what they thought. I fell asleep in the car until my mother found me later that morning (no gooseberry bush jokes please). In the summer months during the 60’s, our group from Southampton visited Dorset regularly, this is ‘CG’ at Lulworth Cove about 1964 – I’ve got my new specs on, but I’m not sure why there’s a safety helmet on the front wing! 'CG’ was a good runner and I would often let ‘CG’ have her head. We were returning from Lulworth, a bank holiday weekend and came up behind a tidy queue of traffic near Wareham; the road ahead was straight for a mile and gently sloping down. All caution was thrown aside and with nothing in sight coming the other way, pulled out, horn burbling, the passengers cheering loudly, I opened up and set about overtaking about a hundred cars – clever me! About 2/3rds of the way along the road I could see a car pottering along a side road towards the main road on our side. Slowly it came to me that we would arrive at the junction at about the same time, the further thought occurred that if he turned towards us he might not think to look our way after seeing nothing coming along from his right. The brakes on ‘CG’ with four up were not the most efficient and there were no ‘holes’ in the traffic queue for me to slow down and aim at. The other car, as anticipated/feared, turned towards us with about a hundred yards to go. The driver was the whitest person I’ve ever seen as he realised that we were in full flight on his side of the road. Whilst making a vain attempt at stabbing the brakes on, miraculously a gap appeared in the queue, with a bus lay-by just beyond it. We swerved in – always difficult with an Austin Seven, all brakes nearly locked, slipped into the bus lay-by and then with the queue starting to gain momentum and leaving ‘start-up gaps’ we rejoined the traffic flow. How we didn’t hit anything, or turn over (that did happen once) I don’t know. The rest of the journey was taken more cautiously, a smell stayed in the car a few days! October 9th often occurs as an important date in my life, 1960 I had a look at my first potential car, a 1928 Morris Cowley with a 1933 Commercial radiator, Dad gave me good advice and I passed it by. 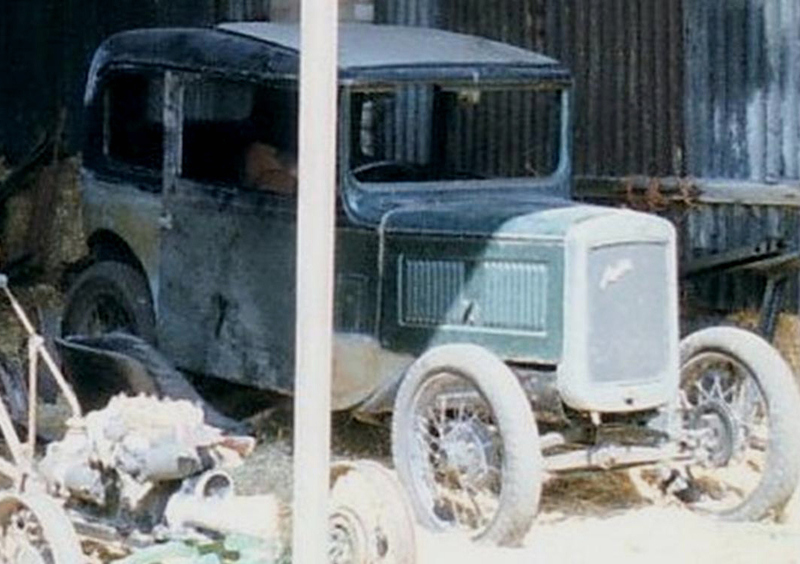 1961, my first Austin Seven was purchased from a shed at Weyhill – it lasted 3 weeks. 1962 I stopped drinking cider; I almost stopped totally on that date. 1965 was a very memorable party with a girlfriend who worked in the wardrobe dept. at the BBC in London, 1967 the breathalyser test was introduced, 1968 I left home in Winchester and 1972 my eldest son was born. 9th Oct 1967 – I had taken some Southampton friends home in ‘CG’. I had just left the Bassett Hotel Jazz Club, having gone back to collect my fee, and I noticed a Police ‘road block’ up on The Avenue, I thought I would head ‘CG’ down towards Millbrook and then back up towards Winchester, avoiding the Police. ‘CG’ flew down the road and hit the roundabout fast, round we went, the rear quarter ecliptic’s helping to steer us round the curve, then turning the wheel sharply to take us back up towards Winchester, the front half elliptic rolled over, the rear quarters thoroughly enjoyed the excitement and contributed some extra boost to the steering and over went the car onto the driver’s side. ‘CG’ had also managed to end up facing towards the roundabout. It took a moment for me to decide which way up we were, plus avoiding all the tools and bits and pieces flying around. I flung open the passenger door, the strap and gravity fortunately stopping it going too far, quickly climbed out onto the road, put my hands under the side of the car and with a heave had ‘CG’ back on all four wheels with only a minimal amount of oil on the road. I opened the driver’s door – with difficulty as the side was slightly damaged – got in, pulled the starter and away we went, back round the roundabout towards a friends flat to recover. On the other side of the roundabout a police car was coming up the road. I heard 10 mins later on the radio that the ‘breathalyser’ had been introduced that day. A friend told me the following morning that the policemen I’d seen where testing anything that moved on the roundabout that night! The tale has a further twist, about 4 years later I was in the Yellow Lion, behind Liberty’s in London, and conversation turned to Austin Sevens. A lad recalled the tale of an Austin Seven in Southampton that had turned over in front of his eye’s late one night, it had happened so quickly and because he was tired, possibly drunk, he wasn’t sure if it had really happened. I owned up and said it was me; that ‘CG’ still had the scars, a bent offside front wing and the body creased above the driver’s door. As the car was parked outside the pub, we all trooped outside and had a look. A photo of ‘CG’ in the late Ray Walker’s barn, Camb’s. in 1998 still showed signs of the crease. Summer weekends in Dorset were a regular thing for my social group from Southampton. We used to meet up regularly on Saturday at the Greyhound, Corfe Castle, a favourite place to sit outside of at lunchtime. The Greyhound is on the knuckle of the A351 in the village and is also the turn-off for the square, you saw motorist’s silly actions as they approached and passed us by. A lovely spot. I was there recently but the traffic is more intense and the square doesn't have the casual parking of the 60's. ‘CG’ was parked facing the front door of the Greyhound, I noticed something hanging down onto the road, the village bobby also arrived at that moment and confirmed my observation by saying he thought there was something, “….not unlike a brake cable, hanging down in two parts from the front axle, get it fixed lad”. Like today, I did not carry a vast array of spares and certainly not a front brake cable, but I did have some string, so under the car and off came the offending cable, attached the string, suitable greased in chassis gung, front brakes back in action! Local bobby came back at about 2.30pm (closing time) and ignoring evident imbibing, got down and checked the front cable. He remarked on the surprising availability of Austin Seven spares in the Isle of Purbeck and then proceeded to sort out yet another ‘incident’ at the road junction outside the Greyhound. We set off down the hill, heading for Studland Bay, but unfortunately the joy of getting away with it and gravity meant ‘CG’s’ speed was greater than desirable, the traffic stopped and we didn’t. ‘CG’ went into the back of a car, the driver flew out, kicked his rear bumper and then declared it hadn’t been so solid for years, got back in the car and moved off. The local Bobby was still sorting out the problem at the junction. He did catch up with us the following week in Corfe Castle and passed some wry comment, but by then I had fitted a new cable from Kirby Wiske – I still have the invoice. 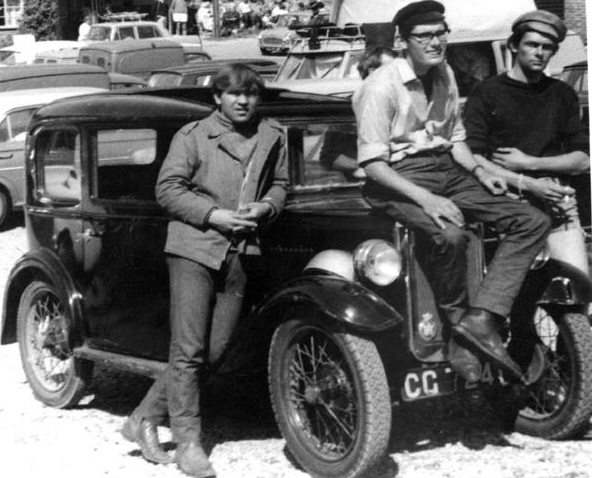 I was a member of a number of Societies during the 60’s, including the 750 MC, and 'CG' enjoyed attending the events and hill climbs. One hill climb at Bruton in Somerset I recall well. On the A303, near Mere, ‘CG’ was overtaken by a Mini 7 with occupants shouting out abuse to all and sundry – this never happened in ‘CG’ (o’ yes!). We saw the Mini parked at the hill climb, bonnet up and fumbling greasy hands unable to make the car reach the start line, serves you right I thought. After the meeting ‘CG’ got away sharpish and we were rolling along, when the Mini again overtook us, ‘CG’ was taking a quieter (but straighter) back road I thought I knew avoiding both Salisbury and Andover towards Winchester. I opened it up a bit and pushed ‘CG’ to follow the Mini. I must have been subconsciously influenced by the Austin Seven specials at the hill climb and thought if they can do it so can ‘CG’! The road started to have dips and humps, at one point ‘CG’ came to a bridge rather fast. In fact far too fast as it was a hump backed bridge, the springs bottomed and ‘CG’ flew through the air. Her straight-ahead course was perfectly maintained, unfortunately the road turned sharp left. ‘CG’ landed on the opposite grass verge (or so it seemed), through an open gateway and after some initial bumps, along the furrows of a ploughed field. When a modicum of decorum had returned, the local farmer was found and ‘CG’ pulled backwards out of the field, muddy, shaken, but not stirred. ‘CG’ started on the button and we were off again. ‘CG’ had lost about ½ an hour journey’s time with this little excursion, so we were surprised to see the Mini about 4 miles further on, parked on the verge, bonnet up and lots of sad faces and greasy hands again, we never saw them again. I’m sure ‘CG’ smiled, but then that may have been because I was driving her slower. When the MoT was first introduced, not every tester was worldly wise, even if they did have the MoT Testers guidelines to work from. I know many cars had to be scrapped after many years of faithful service, once the examiner got underneath and had a look. I well remember the brown rimmed smooth tyres! Anyway there was plenty of advice to be had from old timers about improving the efficiency of the Austin Seven brakes. My friend’s father had a set of brake drums which he left to rust etc, as he said “special for police check appointments” and he thought they would be just the job for the new MoT Test on ‘CG’. I took ‘CG’ down to my friends house in Southampton, just round the corner from the testing station, changed the drums over and onto the test. I was told I could watch. There was nothing wrong physically with the car, then the tester said he had a young apprentice and he would be doing the braking test. It was raining, the lad set forth over the main road and down a side street opposite the garage in full view of us. The brake lights went on for the foot pedal test and the car stopped, presumably he read the meter, then set forth again at some speed, now the hand brake test, the lad must have thought “I’ll give this some wellie ‘cause hand-brakes ain’t much cop!” ‘CG’ pirouetted 3 times on the wet road, wheels locked up, without thankfully hitting another vehicle – there were not many cars parked in side streets in those days. The apprentice walked back to the garage muttering some Anglo-Saxon adjectives. I had to go and get the car from where he had left it across the road, return ‘CG’ to the garage for the final part of the test. ‘CG’ passed OK; the young lad learnt a lesson. I took ‘CG’ straight back to my friend’s house and swapped the drums over to something less sensational. In the 10 years I drove ‘CG’, I only hit 2 other cars because of poor brakes. Amazing once you’ve moved to Cornwall the relations that seem able to crawl out the woodwork and come to visit! My Aunt came from Suffolk to see me and over dinner, looking at an Austin Seven on the drive, reminded me of the time I wore wellingtons to drive ‘CG’. Aunt alleges it was because of the holes in the floor. Now whether I did this to keep dry or to keep the draughts away from my trouser legs, I’m not sure. But the occasion was in 1967, driving from Winchester to Norwich for a job interview and I stayed overnight with Aunt in Bury St Edmunds – even then I was collecting ‘Brownie Points’ for visiting family relations. My current Box Saloon has ‘air’ going up the trouser leg from the ill-fitting rubber mat to the gearbox. I recall ‘CG’ was often more basic in floor covering, none, and because of the fumes and draughts coming in over the flywheel cover area probably accounts for my habit of driving with the window fully open. As the interview was in October, there may have been rainwater about and thus wet inside the car, another joy I seem to recall. I can still drive with wellingtons on – size 9’s – and even big hiking boots, I don’t know how, but I seem able to put one foot on one pedal! Unfortunately ‘CG’ had ignition troubles 6 miles outside Norwich and I had to leave ‘CG’ in a lay-by and catch a bus into Norwich. 1½ half-hours late, greasy hands and I still got the job. I caught the train back to Winchester, got a few bits together and the following weekend, travelled back to find ‘CG’ unsullied, I wonder what chance of that now, remedied the fault and drove back to Winchester, probably still with my wellies on. These little tales by Sandy Croall originally appeared as a series in CA7C Seven Focus in May 2002, p19; June 2002 p7; July 2002 p24; August 2002 p24; September 2002 p24; October 2002 p22. I had owned ‘CG’ from 1963 and used it as everyday transport around Southampton, London and Norwich, plus various long excursions including regular trips to Sheffield to see a nurse!!!! This was until 1970 when ‘CG’ was stripped down, the engine rebored etc, all ready to go to Somerset and my new job on M5 construction - days of gazumping and Roxy Music. Unfortunately the car failed the MoT on the king-pins, so it had to be left in Norwich. A friend agreed to store the car in a garage until I could return, rent being sent regularly. In 1974, I returned to the garage in Norwich to find a block of flats on the site, no car and no friend! The garage owner had sold the car to cover the rent. Due to a busy time working, little money, family starting to play havoc, somehow a lost car was not so important. Over the years the odd search revealed nothing until late in 1998 when a search on the Internet found a note for bids on the late Ray Walkers estate including ‘CG 7241’ in need of restoration. I contacted Ray Walker's son to be told (correctly) that he could not say who had bought the car, but they seemed more interested in the number plate than the car. Ray's son did give me a list of owners from '74. It seems the garage owner sold ‘CG’ to a Mr Clark from Cambridgeshire, who taxed it for 4 months only in '75. Ray Walker bought the car on 15th April '76 and immediately sold it on to Mrs Wright, who left it with Ray Walker to restore. After a few years, she decided she could not afford a full restoration and sold it back to Ray Walker in '83 (without it ever leaving his yard). ‘CG’ languished then until the 1998 auction. CarMarks of Hull bought ‘CG’ and sold the plate 'CG 7241', re-registering it as WSJ 455. I think the next owner was Dave Tedham who sold it in Feb '99 to Kevin Benn. Kevin has done a lot of work on the car, including a body off chassis refurbishment and tidying up the bodywork, the engine has clean oil in it and the bores still show traces of the rebore I did in 1970, only the bottom of the doors have any rust, but they did in the 60's too. Kevin sold ‘CG’ on to a George Pool in July 2002 - I was 2 days late contacting the advert in Classic Car Mart. George did nothing to the car and sold it to Eddie Hunter, without sending in the V5, tut, tut. In June 2003, I was looking at a Feb. edition of the Bristol Club newsletter and spotted Eddie with WSJ 455. I wrote to him straight away, but heard nothing until beginning October when he rang at about 11 pm. I thanked him for the call and got a first refusal should he want to sell it? A couple of weeks later, I had the call, so I called in to see him at Gloucester on Friday 17th Oct. to view, make an offer and we shook hands on the deal. I know that it is ‘CG’ because my 1966, 67, 69 and 1970 Beaulieu plaques are still on the bulkhead and a hole I punched through behind the glove box for a bulb horn. They say everything happens at once, I wanted to call in to take some photos on my return via Gloucester to Devizes on the 18th, but the seller would not be in, so I continued to Devizes to see my ailing father. He died an hour after I arrived. Imagine what the family would have thought had I delayed my return to look at "that old car again." A week after the funeral I collected 'CG ' and ‘CG’ now awaits attention. Christine has made me promise not to forget CV 9998. PS, I bought ‘CG’ for £4.4.3½, at a Jazz club in Southampton in 1962, CV 9998 became ours in 2002 through a whisper at the Jazz Club in St Erth, perhaps I should avoid Jazz? As told by Nickel. - The true tale of three baby Austin’s and a beautiful lady. A little over a year ago, my wife was becoming more aware that her battle with cancer was drawing close to an end and I'm not the sort who is comfortable with counselling. She realised I needed an outlet for my frustrations, so we bought a very tatty but MoT'd Ruby with the money from selling her car. A little while after she died, I found the evenings very long and difficult, especially after I had got our three small children to bed. The Ruby had been a welcome diversion, and therefore I decided rather than taking the Ruby off the road, I would get another, do that up, then whilst using the restored (2nd) car, start on the original one, so I bought a half restored Ruby - Off the road since the 60's... Then I saw a Box Saloon advertised with a trailer thrown in for free, and reasoning that the trailer would be worth about half the asking price to me - as that was what I was looking to pay for one. But somehow I ended up with the car but not the trailer. I'm still not quite sure how! The beautiful woman... well we met recently and she is in a similar position to myself, her husband died leaving her with three children as well, we somehow have found time for each other and it works, but it looks as if the children will only be able to listen to Roald Dahl's tales about the Box Saloon, because there won’t be the space or time in the future for three cars and the Box is the furthest from the road. So it’ll have to go. Oh! - The Ruby’s - My first Ruby took up smoking from the starting handle - and despite trying those Nicorete patches - she wouldn't give up. So I took out the engine out of the original Ruby and put it to one side for future attention and replaced it with the engine out of the semi-restored Ruby. Then I realised it would probably be better getting rid of the second Ruby, as I was unlikely to find much time for it... which of course now needed an engine. Then the beautiful woman said, "Why don’t you just pay to have the Ruby engine you took out repaired?" - See - she is smart as well as beautiful! (I want first refusal on the woman, such wisdom! ).